Meredith Delord, PTA earned her Bachelor of Arts in Communication Disorders from Louisiana State University in 2008 and earned her Associate of Applied Science in Physical Therapy from Delgado Community College in 2013. In her role as Physical Therapist Assistant, Delord works directly with the physical therapists to help clients and athletes improve mobility and motion, whether to enhance daily function or advance sports performance. She is certified in LSVT BIG Therapy for the treatment of Parkinson’s patients. 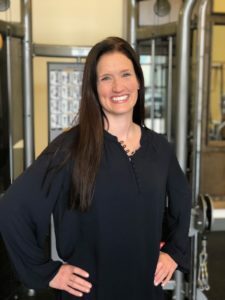 She also serves as BRIO’s professional Ideal Protein coach mentoring, educating and supporting clients throughout their weight loss process. Delord is a certified Jazzercise instructor and is active in the local running community as a member of the New Orleans Track Club. She is a New Orleans native and currently resides in Metairie.